This document provides an overview of the features and benefits of Panasonic i-PRO video surveillance products. Ensuring a safe environment for customers and employees, reducing shrinkage and preventing loss are important. i-PRO video surveillance maximizes store profits by deterring shoplifting, sweethearting, employee theft, vandalism and other problems. The Intelligent face recognition system makes surveillance operation more efficient and also helps improve marketing by providing visitor statistics such as people counting and heat maps. An education environment should be open and safe, while maintaining student and teacher privacy. i-PRO video surveillance is an essential tool to protect students, teachers, staff and visitors from bullying, violence, vandalism, unauthorized entry and theft on campus. Panasonic provides a privacy-conscious camera that is ideal for schools and education. Mobile monitoring on smartphones and tablets enables staff and teachers to share live and recorded videos, ensuring safety and good communication on campus. Nothing is more important than the safety and security of patients, doctors, nurses, staff and visitors. Patient records, medicine and medical equipment are to be protected as well. Medical facilities have many places to monitor including entrances, exits, waiting rooms, emergency rooms and parking lots. i-PRO video surveillance is effective for ensuring security with intelligent detection features such as intruder, loiterer and removed/left object detection. Clear recordings with irrefutable visual evidence can prevent dishonest customer claims and resolve employee disputes. Banks and financial institutes are one of the industries that need video surveillance the most to improve protection against robberies, prevent internal and external fraud and increase security and safety for employees and customers. i-PRO video surveillance provides a reliable and flexible system from the parking lot to the bank vault. When analog CCTV is already installed, Panasonic protects your existing CCTV investments, providing a scalable and cost-efficient migration path. 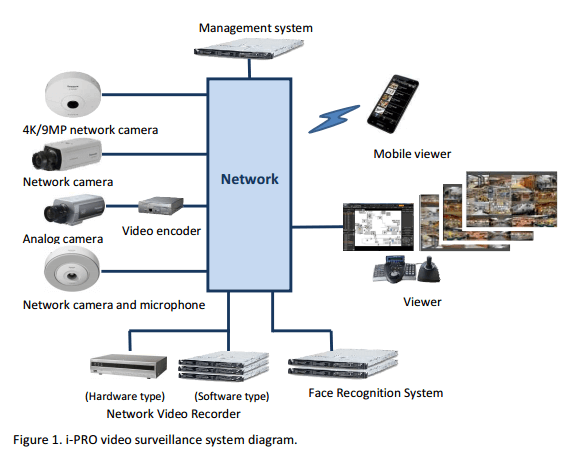 As shown in the figure bellow, i-PRO video surveillance system is composed of cameras, microphones, viewers, recorders, a management system and optional systems. The wide range of i-PRO video surveillance products enables you to build up optimal video surveillance for your requirements. A network camera is a networked surveillance camera that transmits images directly over an IP network. Network cameras enable users to locally or remotely view and manage them from anywhere on the network. Analog cameras can be used in IP systems by connecting them through video encoders that convert analog video signal to IP video signal. Sound can make help operators to grasp what suspicious motion is, understand quickly what is going on and respond accordingly. Audio-capable network cameras and network microphones transmit audio on a single IP network. A viewer is a monitoring interface that displays video from the network cameras and recorders. IP video surveillance enables viewing video on devices such as HD monitors, PC monitors, smartphones and tablets from anywhere on the network. A Network Video Recorder (NVR) is an IP-based video recorder that stores videos directly sent from network cameras and plays back the stored footage. NVRs can be categorized into hardware and software. The hardware NVRs are robust, compact, fully featured all-in-one solutions including viewing, recording, alarms, searching, networking and management. The hardware NVRs provide easy deployment and ease-of-use. The software NVRs run on a PC server, providing flexibility, high-functionality and scalability. Centralized management is essential to efficiently run a video surveillance system that has many devices such as cameras and recorders, or multiple sites. Centralized management system enables monitoring videos and controlling the system from operation centers locally and remotely. Panasonic management systems provide flexible and scalable centralized management for systems of all sizes. A face recognition system, which is one intelligent video system, improves surveillance accuracy and effectiveness, enabling automatic detection such as finding wanted persons on live and recorded footage. Another way to use the facial recognition is to change the video data to a business gold mine. Statistics including visitor demographics provide valuable information to improve marketing, store operations and more. Panasonic offers a wide range of network cameras which are categorized into Fixed, Fixed dome, 360-degree and PTZ/PT types. Each type may have indoor, indoor vandal-resistant and outdoor models. Table 1. Types of network cameras and network microphone. The pictures above show major examples of each type. Panasonic outdoor network cameras are ready for mounting outdoors, saving installation time and costs. Integrated with weather- and/or impact-resistant housing with IP66-, IK10- and/or NEMA 4X-ratings, external housing is no longer required for outdoor installation. Built-in electrical dehumidification keeps the cameras in good running order for many years by removing moisture from inside the housing. Panasonic indoor vandal-resistant cameras have impact-resistant housing with an IK10 rating. Most outdoor/indoor vandal-resistant fixed dome cameras maintain fine focus even when they are subjected to external mechanical shock. IP ratings - The Ingress Protection (IP) rating classifies and rates the degree of mechanical casing protection provided. IP66 indicates no dust ingress. The enclosure protects the camera against harm from powerful water jets projected from any direction. IK ratings - The IK code is an international numeric classification for the degree of protection that enclosures provide for electrical equipment against external mechanical impact. IK10 is the top grade. NEMA ratings - The NEMA rating classifies and rates the grades of electrical enclosures against environmental hazards. Type 4X indicates corrosion resistance in addition to the 8 waterproof performance equivalent to IP66. Built-in shock absorber - In case the camera is subjected to mechanical shock, the built-in shock absorber protects the optical system from the impact by moving the lens system backward. The energy absorbing mechanism consisting of springs and a decelerator effectively diminishes the impact. Dehumidification - The built-in electrical dehumidification keeps the camera dry inside, using electrolysis to remove any moisture from the camera. This anti-humidity technology is safe and green due to low power consumption and no heaters or mechanical fans being used. Heater and cooling fan - The built-in power-saving heater and long life cooling fans protect the camera from ambient temperatures. The outdoor cameras are also designed to cancel out effects from thermal expansion and shrinkage. Hydrophilic Coating - The hydrophilic coating on the camera dome keeps visibility in rainy weather, sheeting water off instead of forming droplets that scatter light. Sun shield - The shield protects the cameras lens from direct sun light. Fixed Network Camera - A fixed network camera is box-shaped and points in a fixed direction to monitor a specific area once the camera is mounted. Due to the visible form, the fixed network camera is often installed where effective deterrence and prevention are required. Indoor fixed network cameras may have exchangable lenses and a suitable lens can be selected for the desirable field of view. Panasonic also offers stylish cylindrical fixed network cameras that have built-in lenses for easy installation. The indoor/outdoor fixed network cameras may have built-in or optional infrared (IR) illumination to produce clear monochrome images in low light or complete darkness. Fixed dome cameras - A fixed dome camera is a dome-shaped fixed camera. Due to its stylish and less obtrusive design, the fixed dome camera is ideal for unobtrusive installation for discreet monitoring. An optional smoke dome cover makes it hard to see which direction the camera is pointing; fixed dome cameras are usually mounted on a ceiling or wall. Panasonic also offers compact, wide view fixed dome cameras that can be installed in vehicles including buses and trains, as well as on ceilings and walls. Some indoor/outdoor fixed dome cameras are equipped with built-in infrared (IR) illumination to produce clear monochrome images in low light or complete darkness. 360-degree network cameras - 360-degree network cameras provide a 360°/180° field of view with wide area coverage from wall to wall and ceiling to floor. In camera dewarping delivers clear fisheye, panoramic and dewarped images with an electrical pan-tilt-zoom. 360-degree cameras are ideal for surveillance that requires wide area coverage such as at shopping malls, retail stores, airports, railway stations, parking lots, factories, warehouses and offices. With the latest 4K HD video technology, 9 MP 360-degree network cameras deliver very detailed 9 megapixel images, enabling easy and clear identification of people and objects in its 360° wide view. Pan-tilt-zoom (PTZ) / PT network cameras - The PTZ cameras, which pan from side to side, tilt up and down and zoom in and out, enable conducting video surveillance over a large area and zooming in to check details. Some PTZ cameras offer 360-degree continuous panning. Advanced auto tracking enables the cameras to automatically track a person or object; the network camera tracks the moving object until the target passes from its view. When the target leaves its view, another camera uses Panasonic inter-camera notification protocol to resume the tracking. The main components of a network camera are a lens unit, image sensor, system LSI, Ethernet (LAN) interface and input-output interface. The system LSI integrated with AV processors (DSPs) and a high-speed CPU on a single chip provides image processing, compression, networking and intelligent video. Panasonic network cameras may have SD memory card slot(s) for local recording, and audio and I/O interfaces. Electrical power can be supplied through Ethernet cable (PoE) or 12V DC. Clear images need clear input. The optical system including lenses and an image sensor is precisely designed and manufactured for superior imaging performance. Aspheric lenses have many advantages such as less spherical aberration, less distortion and smaller lens size, but manufacturing aspheric lenses was difficult due to their high precision requirements. Panasonic lens technology including ultra-precision machining and measurement achieves superior imaging performance, now clearly capturing every square inch of the view area. Auto Back Focus (ABF) maintains a fine focus, automatically controlling the precise image sensor position. The built-in shock absorber also protects the optical system from vandalism. Panasonic MOS image sensors with the latest semiconductor technology catch the incoming light effectively with large micro-lenses and photo diodes, resulting in clear, low-noise images even in difficult lighting conditions. The 120 fps-capable high speed image sensor and the powerful UniPhier processor produce clear Full HD 1080p / HD 720p images even at a 60 fps high frame rate. UniPhier is a high-performance chipset in which Panasonic integrates its audio and video processing technology. UniPhier packs a high-performance AV processor (DSP) and high-speed CPU on a single chip and provides high-quality audio and video, efficient data compression and intelligent video with low power consumption. 60 fps video provides non-jumpy, smooth monitoring. Analog video is smooth compared with 30 fps digital video due to the scanning difference: interlaced and progressive. Interlaced analog video scans the display twice, using two fields, to complete a single frame. The interlaced NTSC/PAL video scans around 60/50 fields per second, creating a perceptual illusion of smooth movement. The 120 fps-capable high speed image sensor and the powerful UniPhier processor produce a smooth and flickering-free 60 fps video. Enhanced Super Dynamic, the latest Super Dynamic technology, enables clear and easy identification in a high contrast situation, delivering an industrial-leading 133dB wide dynamic range. High contrast is commonly found in video surveillance, which has very bright and dark areas to cover. The 120 fps high-speed, high-sensitivity image sensor captures four images per frame with short and long exposures. The short exposures capture the bright areas well and the long exposures capture the dark areas well. By combining them into one frame, the Enhanced Super Dynamic results in clear images. Multi-process Noise Reduction (MNR) increases visibility in low light, effectively reducing the noise from images. The electrical gain level is increased to amplify the video signal in low light but the increase causes grainy video. Panasonic MNR produces clear images, applying optimum noise reduction according to the brightness of the part of the image. Super Chroma Compensation (SCC) recovers colors when the built-in IR cut-filter is removed in low light, eliminating the effect of infrared light. Intelligent Video helps security staff quickly detect suspicious individuals, objects and movements, automatically analyzing the video stream and extracting useful information from images such as detected intruders. Most Panasonic network cameras provide real-time, camera-based intelligent Video Motion Detection (i-VMD). Camera-based Intelligent Video does not require high-performance central servers, making the system easier-to-deploy. Intruder detection detects people or cars trespassing in restricted areas. Once they step into a pre-defined detection area, the camera sends an alarm to the operators. Loitering detection detects people who are loitering in front of a camera. When a human-sized moving object loiters for a specified period of time, the camera sends an alarm to the operators. Direction Detection detects people, cars or moving objects that go the wrong direction such as the wrong way on a one-way street. When an object is moving in an unauthorized direction, the camera sends an alarm to the operators. Scene Change Detection detects tampering with the camera view. When a network camera detects interference or tampering such as spraying on a camera dome, changing a camera direction or covering a camera with a cloth, the camera sends an alarm to the operators. Object detection detects objects disappearing that should be present or something left behind that should not be there. A network camera constantly keeps watch on pre-defined areas, comparing current and past footage. When a left or removed object is detected, the camera sends an alarm to the operators. Cross Line Detection detects people or objects trespassing in restricted areas. When an object crosses an imaginary line in a pre-defined direction, which can be incoming, outgoing or in either direction, the camera sends an alarm to the operators. Panasonic network cameras send out streams appropriately sized for receiving devices and networks. Monitors, recorders, smartphones and remote sites such as branches have different Figure 19. Cross Line Detection Baseline Main/ Extended High Compression efficiency C om p lex ity / R e q u ire d p erfo rm a n c e 15 requirements for image quality and network bandwidth. Panasonic network cameras enable saving the network bandwidth by sending out multiple H.264 and JPEG streams appropriately sized for each device requirement. The latest network cameras support up to four high Profile H.264 streams. IP multicasting effectively reduces the network bandwidth requirement when many end-points such as viewers and recorders receive the same image. While IP unicast transmission uses a stream for each end-point, IP multicast uses only a single stream for a group of end-points. Variable Image Quality on Specified area (VIQS) is one bandwidth saving technology focused on the degree of importance in a view. Areas where operators have to watch cautiously require high image quality, but the rest do not. VIQS enables assigning proper image quality to each area in a view based on their importance, resulting in substantially reduced bandwidth consumption. VIQS also saves recorder disk space; up to eight areas can be defined. Cropping enables simultaneously sending out the full view and up to four areas cropped from the full view. While recording the full view on the recorder, operators can watch the cropped area closely with less network bandwidth. Edge-recording and the redundant IP network design make surveillance systems more reliable. Some network cameras have SD memory slot(s) for edge-recording that temporarily stores captured images on the camera. This ensures video recording continuity even when the network between the surveillance center and cameras is down. Images can also be stored on the SD memory card(s) when an alarm is activated such as by a connected sensor or i-VMD. Some indoor fixed cameras employ a versatile design that offers simplicity of choice, ease of management and low total cost of ownership (TCO). By attaching extension units to the cameras, their versatility increases, enabling them to handle new uses. For example, an IR-LED extension Low image quality to unnecessary area Monitor Monitor Recorder 17 unit turns a fixed camera into a fixed day and night camera. Power over Ethernet (PoE) makes it easy and simple to install IP cameras by providing electrical power over a copper Ethernet cable. PoE provides up to 15.4W of power, while PoE plus allows up to 30W of power which some outdoor cameras with built-in heaters require. Sound can help operators to grasp what suspicious motion is, understand quickly what is going on and respond accordingly. Most Panasonic indoor and outdoor network cameras have one- or two-way audio capability. The cameras are easy to install because both audio and video are sent on a single IP network; no additional cabling is required. Some countries and areas restrict using audio in video surveillance. Panasonic suggests checking the relevant laws and regulations before using audio. Equipped with a 16-microphone array and Panasonic’s advanced audio signal processing technologies, the network microphone picks out sound in any direction at 20-degree directionality (half-width at half maximum). Audio monitoring starts by clicking on the screen where you want to hear. All sounds are recorded on the Panasonic NVR and any place can be selected as a monitoring point when needed. The network microphone is designed to install with a 360-degree network camera. The camera and microphone blends into interiors. The latest 4K HD video technology opens a new frontier of video surveillance. The 4K standard provides 8-megapixel resolution which is four times higher than Full HD 1080p, six times higher than HD 720p and 24 times higher than NTSC standard video. The 4K technology is becoming popular because 4K televisions are penetrating into homes and offices. With its superb high resolution, 4K surveillance cameras enable capturing wider areas and more detailed distant people and objects. It is time to start 4K video surveillance. The 4K technology and 12 MP image sensor clearly capture a wide area over hundreds of square meters in its 360° view. Equipped with a new 4K Ultra Engine and 4K-optimized optical system including a large diameter lens and a 1/2-inch high-sensitivity image sensor, the 9 MP 360-degree cameras enable more reliable identification of people and objects from the center to the edge and from wall to wall. The 9 MP 360-degree cameras have been newly designed for 4K resolution. 4K resolution requires a highly-accurate optical system as well as a high-resolution image sensor. Panasonic fisheye lens - Panasonic advanced lens technology solved the problem where the fisheye image was distorted and blurred near the periphery of the 360° view, resulting in a clear image from wall to wall and ceiling to floor. The new aspherical fisheye lens accurately leads light to the image sensor. ABF designed for 360-degree camera - Auto Back Focus (ABF) keeps a fine focus for 4K imaging, canceling out the effects from day/night switching and thermal expansion. 12 MP, high-sensitive CMOS Image sensor - The image sensor is designed for 4K-video surveillance. The 1/2-inch, 12 MP CMOS image sensor produces clear and detailed images with high-sensitivity and low-noise performance. The 360-degree camera uses 9 MP for fisheye view. Powerful 4K Ultra Engine - Equipped with a dual-core 1GHz processor, the new 4K Ultra Engine performs vast calculations per second including Wide Dynamic Range (WDR), in camera dewarping and advanced Intelligent Video features. The high-performance 4K Ultra Engine offers real-time in camera dewarping, distributing images in display formats such as fisheye view, single and double panoramic views, and single and quad dewarped views with the electrical pan-tilt-zoom. Covering hundreds of square meters, the 9 MP 360-degree cameras track people flow in their wide view and provide useful information which helps business improve operations and customer service. Heat Map enables you to quickly identify hot spots, high-traffic areas, bottlenecks and dead areas, making customer traffic visible. The color-coded traffic pattern helps you understand where the customers stay and pass. Equipped with a built-in web server, Panasonic network cameras and NVRs can be viewed on a web browser. If you want to access many cameras and recorders, we recommend using a management system. Panasonic offers easy-to-use, full-featured integrated viewers as a part of i-PRO management systems. If your surveillance system has many devices, this type of viewer is optimal. It enables easy access and monitoring of many cameras and recorders. The WV-ASM200 i-PRO management system is suitable for small to medium installations and the System 970 for medium to large systems. The WV-ASM200 i-PRO management system viewer provides an easy-to-use and feature-rich integrated operator console, supporting up to six PC monitors that have one operation window, up to four live windows for monitoring and one map window for intuitive layout information. The details are described in chapter 7. The WV-ASC970 IP Matrix Client of the System 970 i-PRO management system provides an efficient, full-featured and scalable integrated operator console for a multi-operator system such as a large and multi-site system. The WV-ASC970 supports up to four PC monitors with up to a 16-screen split and one operation display, resulting in 64 monitor windows per client system. The details are described in chapter 7. The Panasonic Security Viewer, a viewer application for iPhone and Android devices, makes video surveillance more efficient, enabling monitoring, playing back and controlling live and recorded video from anywhere on the network. Panasonic NVR’s re-encoding delivers smooth playback on a slow network such as the Internet, converting the large-sized recorded video to a properly-sized stream when accessed. Panasonic offers two types of Network Video Recorders (NVRs): hardware and software NVRs. Hardware NVRs such as the WJ-NV300 provide hassle-free setup and operation with robust, highly-reliable, dedicated hardware. The WV-ASR500 software NVR provides an open and scalable recording solution, running on a PC. The WJ-NV300 Network Disk Recorder is a 2U-sized, compact, robust, all-in-one IP-based recorder that provides the user with full-featured video surveillance including viewing, recording, alarm, searching, networking, management and optional intelligent video. Supporting up to 32 network cameras, the WJ-NV300 is the perfect solution for small to medium video surveillance. The NVR is also suitable for large systems by multi recorder configuration with the i-PRO management system. The multi recorder configuration offers easy-to-manage and highly-reliable recording capability. Ease of use for all users is a key design feature of the WJ-NV300. Equipped with two HDMI monitor outputs, the WJ-NV300 provides PC-less operation that enables users to monitor and operate the system on the HD display with a mouse. Supporting up to two HD monitors, the WJ-NV300 displays the videos with up to a 32-screen split on the main monitor and up to a 16-screen split on the sub monitor. Audio from cameras also plays back on the monitor. The WJ-NV300 supports up to 80 TB, which is large enough to store Full HD videos at 30 fps from 32 cameras for over three months*. The WJ-NV300 has two hard disk drive (HDD) slots and is expandable up to 20 HDD slots, adding two units of the WJ-HDE400 Hard Disk Extension Unit that has 9 HDD slots, resulting in 80 TB recording capacity with 4 TB HDDs. Scheduled and event recording can save disk space. A built-in calculator works out how many days the footage can be stored based on the frame rate, image quality and HDD capacity. * 6-series network camera, 3 Mbps at 30 fps, Fine image quality (FQ) and 24 hours a day recording. WJ-NV300 with two WJ-HDE400. 4TB HDDs. With RAID technology, the WJ-NV300 protects the recorded video from hard disk failure. RAID provides increased reliability through redundancy. The WJ-NV300 supports RAID 1, 5 and 6. The WJ-NV300 provides effective searching to find a video quickly from a vast amount of videos. The calendar and graphical timeline search provide intuitive search operation. The picture is also searched for by logs such as intelligent i-VMD and alarm inputs from external sensors. In recorder dewarping provides easy viewing of live and recorded 360-degree camera fisheye videos. The powerful WJ-NV300 dewarps them on a real time basis without a PC. Remote and mobile monitoring enables viewing live images and playing back recorded videos on a PC, smartphone or tablet from anywhere on the network. The re-encoding transforms a large recorded video to properly-sized data for the network, resulting in smooth playback, even on a slow network connection such as the Internet or wireless. Optional Face matching makes the video surveillance more efficient and accurate, enabling the real-time, automatic detection of a person by their photo. One camera can be assigned for face matching. When the registered person is detected, the WJ-NV300 informs operators by icon, buzzer, e-mail, external devices such as a light and Panasonic alarm protocol. The face matching also helps businesses to improve marketing. The WJ-NV300 automatically estimates visiter age and gender from facial characteristics and outputs staticstical reports. Combining it with a POS system enables better understanding the correlative relationships between customer behavior and marketing. The WJ-NV300 is compliant with ONVIF Profile S for IP-based video systems. ONVIF makes it easy to run with 3rd party ONVIF-compatible cameras. The WJ-ND400 Network Video Recorder is a robust, IP-based all-in-one recorder that provides users with full-featured video surveillance including recording, alarms, searching, networking and management. Supporting up to 64 network cameras, the WJ-ND400 is the perfect solution for medium deployment. The NVR is also suitable for large systems by using multi recorder configuration with the i-PRO management system. The multi recorder configuration offers easy-to-manage and highly-reliable recording capability. The WJ-ND400 provides up to 216TB recording capability. Its HDD slots are expandable to 54 Figure 46. Visitor statistics 27 with nine HDD slots in the WJ-ND400 and five WJ-HDE400 Hard Disk Extension Units, which have nine HDD slots per unit. The WJ-ND400 supports recording modes for secure and effective recording. Emergency mode gives recording top priority. Scheduling recordings and alarm recording such as Pre-event and Post-event enables saving disk space. RAID 5 and 6 protects the stored video from hard disk failure. In case of hard disk failure, the hot-swappable HDD slots enable users to replace hard disks without having to turn off the system. The WJ-ND400 provides effective searching to find a video quickly from a vast amount of videos. The search filter helps operators to quickly narrow down target videos by time, date and events including VMD detection and cameras. The WV-ASR500 recording and video management system is a Windows server-based, open, scalable, high-performance recorder. It features all the functionality required for recording and video management for today’s and tomorrow’s business needs, including viewing on PCs and smartphones, recording, alarming, searching and management. The WV-ASR500 is suitable for middle to large video surveillance systems with the WV-ASM200 and System 970 i-PRO management system. The WV-ASR500 offers an open, scalable and easy-to-use video surveillance system, supporting up to 128 network cameras per server. Over 70 vendors’ camera are supported. WV-ASR500 archiving enables storing important videos for long periods, saving disk space and cost. It supports industry standard, high-capacity storage such as IP-SAN and DAS. IP-Storage Area Network (IP-SAN) is an IP network-based storage, while Direct-attached Storage (DAS) is connected directly to a server. Based on schedules or internal/external events such intruder detection, users can automatically start and stop recording. The event linking also enables operators to set event-driven rules up, resulting in prompt response in emergencies. The WV-ASR500 works with over 20 vendors’ Entry Access Control system (EAC). Panasonic offers two centralized management systems: the WV-ASM200 for small to medium systems and System 970 for medium to large systems. The WV-ASM200 i-PRO management System provides an easy-to-use, feature-rich operator console that unifies monitoring, operation and management of i-PRO video surveillance devices for small to medium users, running on a PC. It supports a configuration from one to six monitors for one operation window, up to four live windows and one map window. The operation window provides centralized operation and monitoring with efficient visualization and smooth access to live and recorded video. The live windows provide multiscreen monitoring with up to a 64-screen split. The map window displays information such as alarms on intuitive maps. The WV-ASM200 i-PRO management System manages up to 32,000 Panasonic network cameras, up to 1,280 analog cameras with encoders and 500 Panasonic network and digital video recorders. The WV-ASM200 offers secure access management; up to 32 users can be registered with five customizable user access levels from viewer to administrator. The operation window offers centralized monitoring and operation of live and recorded video. The optional IP-based WV-CU950 system controller offers easy control of cameras, recorders and management. The live windows provide operators with up to 64 camera views simultaneously on up to four displays. The map window displays information such as alarms on intuitive maps. Up to 64 cameras are indicated by graphic icons on the map. When a camera or exterior sensor detects an alarm, a red-colored icon with a pop-up message notifies operators. The operation window is also switched to the alarmed camera’s view for immediate visual verification. The WV-ASM200’s Visibility Enhancement produces clear images even in poor visibility such as snowfall, heavy rain, high contrast and dark lighting. Combining GPU-accelerated computing and high-speed image processing algorithms, it delivers clear moving images on a real-time basis without losing important details such as color, contrast and movement. Integrated with the WV-ASF900 Face Recognition System, the WV-ASM200 provides automated, real time face detection and search. Please refer to section 9 for details. The System 970 i-PRO Management System is a feature-rich, highly-reliable, scalable and flexible IP-based management system designed for medium to large deployments and multi-site systems. Its powerful central management interface enables operators to quickly and precisely respond to incidents. The System 970 has two parts: the WV-ASC970 IP Matrix Server is a system manager. The WV-ASM970 IP Matrix Client is a centralized operational interface. The System 970 enables a user to build a video surveillance system including over 60,000 i-PRO devices such as cameras and recorders. The System 970 manages up 1,535 network and analog cameras, up to 64 IP and digital video recorders and 1,024 monitors in one domain. A domain is an area where one WV-ASC970 IP Matrix Server controls, making it easy to design and manage the system by dividing it into easily-controlled sub systems. Up to 64 domains can be supported. The WV-ASM970 IP Matrix Client provides centralized, efficient operation regardless of system size or location. Hot standby server configuration provides operational continuity. The standby server takes over automatically when the active server fails. System 970 with the WJ-ND400 NVR provides recording continuity. When a WJ-ND400 fails, the standby NVR switches over automatically. The System 970 enables operators to quickly search for a video clip from large amounts of recorded video. Time and date search, event search and VMD search make it easy and quick to narrow down a search. The System 970 provides a consolidated overview of security and system alarms for immediate visual verification. The map window displays alarm information when cameras or external systems such as a fire alarm system are detected. The programmable alarm management enables operators to set up event-driven rules, resulting in prompt response in emergencies. Integrated with the WV-ASF900 Face Recognition System, the System 970 provides automated, real time face detection and search. Please refer to section 9 for details. Supporting analog devices such as an analog matrix switcher, the System 970 offers a smooth and cost-effective migration path from an existing analog video surveillance system to an 33 IP-based system. Face recognition, which is an intelligent video application, improves effectiveness both in security and business. The WV-ASF900 Face Recognition System provides a cost effective, easy-to-deploy intelligent video solution for small to large businesses. The WV-ASF900 Face Recogniton System helps operators to quickly find a target person from live and recorded videos, automatically identifying the person by estimating the similarity between the captured face and photos in data-bases. Early detection can prevent problems from occurring. After an event, a quick search of irrefutable visual evidence can help avoid dishonest claims and resolve disputes. The face matching of the WV-ASF900 provides real-time, automated detection of a target person by their face. When a person is matched with registered photos in the data-bases, it sends an alarm to the operators. The face search of the WV-ASF900 provides advanced search capability that enables operators to quickly find a target person by their face from recorded footage. The operators can trace the person with a glance at the history table that shows where they have passed by and what they did. The operators can narrow down a target person from all visitors by a camera, a captured or registered photo and day and time. The history table provides easy playback, working with the Panasonic NVRs. Video can be used to improve business; Intelligent Video technology provides an innovative way to use video information for better marketing. By automatically estimating visitor gender and age from their faces, the WV-ASF900 Face Recognition System delivers helpful information such as store traffic. Combining this with sales data on POS selling systems enables better understanding the correlations between customer behavior and marketing. Based on a hybrid architecture, the WV-ASF900 provides high-performance, scalable and cost-effective face recognition. The camera detects, crops and sends a visitor face, and the Face Recognition Server estimates the similarity between the face and photos in the data-base. This hybrid architecture substantially reduces server and network overloads, enabling the WV-ASF900 to estimate faces from 20 cameras on a real-time basis. The WV-ASM200 and System 970 i-PRO management systems manage up to 100 WV-ASF900, resulting in a large system configuration that includes 2,000 cameras. All analog equipment is removed and a new IP system is installed. By deploying the new IP system at once, all IP video surveillance features are immediately available. One-time migration is simple, but can present financial challenges, especially for medium and large installations. Financial challenge for the initial investment to purchase and install all the IP equipment at once. Disposal loss of analog equipment that can be still used. A step-by-step upgrade follows a gradual approach that enables you to enhance the existing analog system at your own pace. Deploy IP equipment according to where it is needed, based on the feature and functionality requirements. Running analog and IP systems during the transition period, the video surveillance becomes a complete IP system. This scenario enables starting small according to your surveillance requirements, easing the financial burden for the initial IP equipment investment. Video Encoders enable integrating your existing analog system with a new IP system, converting analog video signal to IP video signal. The WJ-GXE500 Video Encoder delivers clear images with 3D Interlace-to-Progressive conversion and cable loss compensation. The compact WJ-GXE100 Video Encoder can be installed where convenient, including in an outdoor camera housing or outdoor power box, on a wall or ceiling or in a room. A coaxial-LAN converter offers IP transmission over existing coaxial cables, when continuing to use the analog cable infrastructure is necessary because of factors including past huge investment for cable, limited cable space and distance between the IP camera and operation center. A Video Decoder enables viewing IP cameras without a PC, converting IP video signal to HDMI or analog video signal. It is suitable for places such as remote sites. Many industry-leading video management system (VMS) companies participate in the Panasonic System Developer Network (PSDN) partner program. These seasoned partners provide excellent video management solutions with unique features and functionalities. The ONVIF forum defines industrial standards for interfacing IP-based security systems so products from different manufacturers can easily work together. ONVIF Profile S is for IP-based video systems and Profile G is for edge storage and retrieval. Supporting the ONVIF as well as i-PRO proprietary interface, the i-PRO products work with a number of 3rd party systems. The Software Development Kit (SDK) enables developers to develop software applications that work with Panasonic i-PRO products. The Panasonic Security-Application Programming Interface (PS-API) provides a model-independent, common interface used for developing applications to monitor, control and manage the network cameras and network recorders. PS-API and its technical documentations are disclosed to the developers. Technology drives business success more than ever before. The age of Internet of Things (IoT) is upon us. The network is connecting everything; people and all devices are connecting with each other on a large scale beyond all imagination. The world will become smarter, more efficient and move convenient. Panasonic continues to work to provide better surveillance solutions including 4K video, intelligent video and business intelligence for your security and businesses.